What Is a 'Morning Star,' and What Is an 'Evening Star'? 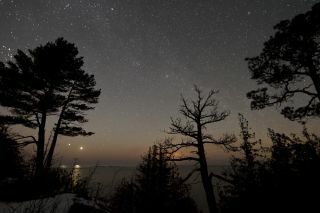 Skywatcher Shawn Malone took this photo of two "evening stars," Venus and Jupiter, in Eagle Harbor, Michigan, on March 10, 2012. Whether a planet qualifies as a "morning star" or an "evening star" can vary throughout the year. I received an interesting inquiry recently from a woman who wanted to know the meaning of the terms "morning stars" and "evening stars." "I mean, they're not stars … they're planets, right?" she asked. "So why do we call them stars? And is a morning star only visible in the morning, like at the crack of dawn, or at other times as well? Hope you can clear this up for me because I'm totally confused!" Originally, the terms "morning star" and "evening star" applied only to the brightest planet of all, Venus. Far more dazzling than any of the actual stars in the sky, Venus does not appear to twinkle, but instead glows with a steady, silvery light. The fact that Venus was a "wandering star" soon became obvious to ancient skywatchers, who noticed its motion relative to the background stars, going from the eastern sky in the morning to the western sky in the early evening. Nicolas Camille Flammarion, a noted French astronomer in the late 19th and early 20th century, referred to Venus as "The Shepherd's Star." I myself like to refer to Venus as the "night light of the sky." So, it's easier to understand the origin of the terms "evening star" and "morning star" if we only considered Venus. Of course, Venus is not the only wandering "star" in the sky; there are four others that are also visible to the unaided eye (five, if you include Uranus, which is barely perceptible without any optical aid on dark, clear nights). The difference is that, with the possible exception of Jupiter and, on rare occasions, Mars, none of the others stands out in the same manner as Venus. Nonetheless, somewhere in the distant past, "morning star" and "evening star" became plural in order to account for the four other planets. This upcoming week, there are officially no evening stars, only morning stars. But the distinction between these terms is not very precise. As an example, let me call attention to the fact that rising in the east this week, between 7:30 p.m. and 8 p.m., is the planet Jupiter. It will attain its highest point in the southern sky between 1:30 a.m. and 2 a.m. local time, and will still be visible, sinking in the western sky at dawn. The giant planet is thus ideally situated for observations of its changing cloud bands and four big satellites for much of the night. The fact that Jupiter is already above the horizon during "prime-time" evening hours should qualify it for evening-star status. By the same reasoning, it is a morning star as well! The next planet due to come into view will be Mars, which rises soon after 12:30 a.m. local time and is crossing the southern meridian by sunrise. So, the Red Planet must be a morning star. With Mercury and Venus, there is never such ambiguity, as they are never very far from the sun in the sky. In fact, in the pre-Christian era, both of these planets had dual identities — two names — as initially, it was not realized that they alternately appeared on one side of the sun and then on the other. Mercury was called Apollo when it shone as a morning star, and was called Mercury when it appeared in the evening sky. Venus was Phosphorus in the morning and Hesperus in the evening. We can thank Pythagoras around the 5th century B.C. for pointing out that Hesperus and Phosphorus were really one in the same. Because they orbit the sun more closely than Earth does, Mercury and Venus are called "inferior" planets. Elongation refers to the angle between the sun and a planet, as seen from Earth. In general, when Mercury or Venus has a western elongation from the sun, it is a morning star; with an eastern elongation, it is an evening star. Different planets may appear together in the morning or evening sky, depending on their location relative to Earth and the sun. Jim Gemmel of Warrenton, Virginia, took this picture of Venus and Jupiter on March 10, 2012. This rule can be extended to the planets that orbit the sun beyond our own orbit — the so-called "superior" planets, Mars, Jupiter and Saturn. When a superior planet is in the same spot in the sky as the sun, it is at conjunction. While a superior planet is moving from conjunction with the sun to just a day prior to its opposition (when it is directly opposite the sun in the sky), it is a morning star. At opposition, it rises approximately when the sun sets and sets as the sun rises. From then on, it is branded as an evening star, rising or already in the sky as daytime ends. So, going by this nomenclature, Jupiter will arrive at opposition and will become an evening star on March 8, Mars on May 22 and Saturn on June 3. Until then, they are all morning stars, even though, as we have already seen, Jupiter — and, eventually, Mars and Saturn — will be readily visible in the evening sky well before their opposition dates.